Strategy should govern the type of ship to be designed. Ship design, as dictated by strategy, should govern tactics. Tactics should govern details of armaments. EVEN AT the opening of the twentieth century, the Admiralty headquarters and the Royal Navy were large and complex organisations within which each department and specialisation was pursuing its own line of development. Quite suddenly, in 1904 all these separate developments came together, with great enthusiasm, in the concept of the Dreadnought, the ‘all big-gun ship.’ Some of these developments made such a concept desirable or even essential whilst others made it feasible at acceptable cost. The torpedo menace necessitated longer ranges in action. Long-range hitting (gun) had become practicable. The only method known of ranging at long ranges was by firing salvoes. This necessitated a uniform armament of eight or more guns. The heaviest gun gave the greatest blow, and was the most accurate at long range. Developments which made the concept feasible included turbine machinery, lighter and cheaper construction (despite major improvements in subdivision) and the scrapping of old ships which allowed the cost of the new ships to be contained within a budget which was politically acceptable. Weaving across these separate developments strode the demonic figure of ‘Jacky’ Fisher who, as First Sea Lord, was to provide the drive which brought the Dreadnought into being. His consistent theme for much of his career can be seen in his introduction to the Dreadnought design committee: ‘The battleship is the embodiment of concentration of force.’ The other quotation at the head of the chapter shows that he at least tried to work from a role to a design instead of merely trying to produce a ‘better’ ship than those of the potential enemy. However, Fisher took a long while to decide on how best to achieve his concentration of force; he was almost the last of the key players to support the ‘all big-gun’ concept which he then pushed through with the usual enthusiasm of a new convert. Even as the design commenced, he still did not seem to understand how her heavy armament was to be used. The separate developments will be described before seeing how they came together. Percy Scott’s earlier work, in which he introduced telescopic sights, dramatically increased the rate of fire by his loader training and the rate of hitting at short range by practising ‘continuous aim’ with the dotter. There was a growing realisation in the Navy that rate of hitting was what mattered and that this was not necessarily directly dependent on rate of fire; a point which armchair critics were slow to appreciate. At the end of the nineteenth century target practice was carried out at about 1500yds and in a lecture given by Fisher as C-in-C, Mediterranean, he said that, at that time, the effective range of heavy guns with telescopic sights was then about 3-4000yds and about 2000yds without telescopic sights. Bacon suggests that the firing trials by the French were the spur to longer-range trials in the RN and by 1898 Sir John Hopkins had initiated such trials in the Mediterranean fleet at the then unprecedented range of 6000yds. These trials were continued by Fisher when he took over the Mediterranean Fleet. These showed that the only effective way of obtaining range was by spotting the fall of shot and, for this to be effective, a salvo of about four rounds had to be fired together so that one or more would be short and others over. Against a moving ship, salvoes had to be fired at reasonably short intervals to correct for changes in range and hence at least eight guns were needed. In 1901 Captain E W Harding, RMA, who had taken part in the Mediterranean trials wrote a series of articles in the United Services Journal on fire control followed by a second series in Engineering which were combined in a book published in 1903.8 Percy Scott gave an important lecture at the gunnery school in 1904 called ‘Remarks on long-range hitting’. Further, very careful, trials using the Victorious and Vengeance were carried out. over a period of three months in 1903 using Harding’s articles as the basis of planning. Harding’s report on the trials was issued by the Gunnery Branch. The findings of the earlier trials were confirmed and it was also realised that the splashes from the 6in secondary armament merely obscured the more important splashes from the 12in. The need to spot the fall of shot and apply corrections before the next salvo meant that the effective rate of fire of a 6in at 6000yds was much less than that achieved in short-range target practice; in fact, as range increased, the rate of hitting by the 12in exceeded that from the 6 inch. The effect of a 12in hit was vastly greater than that from a 6in. There was also hope that the 12in BVIII mounting (1904-05 programme ships) could be elevated sufficiently quickly for ‘continuous aim’ as in smaller mountings. As Director of the War College within the RN College at Greenwich, Captain May carried out a series of ‘war game’ studies in 1902 which had a considerable influence on thinking about the future battleship. His reports on some of these exercises have survived in the PRO; in one such study he investigated the value of speed, concluding that it was of little value compared with guns and armour. Another study showed the value of the big gun. Prior to the design of the Lord Nelson, the then Controller, Sir William H May, initiated an inquiry into the gun power and protection of battleships and in conjunction with this, the new DNC, Phillip Watts, prepared a wide range of battleship designs of different characteristics. Diagrams were prepared which showed the areas of the ships side which were armoured or unprotected as a base. On this, ordinates were set up showing the thickness of the armour (allowing for curvature, eg barbettes). On a separate, parallel base another set of ordinates were plotted showing the projectile weight which could be delivered from each size of gun in the attacking ship in a given time. Horizontal lines showed the weight of each projectile and areas which could resist the given attack were coloured blue whilst areas which could be destroyed were shown in red. These diagrams showed very clearly that the extent of damage and rate of damage from the secondary (6in) battery was much less than that due to the main armament and that the damage caused by the big guns was so severe that the secondary armament would be swept away before it could get into effective range. Heavier armour was required over a much larger area than had previously been customary. It was also concluded that the secondary armament of 6in guns was of little value. In consequence, the Lord Nelson was given thicker and more extensive armour and the 6in battery was done away with in favour of a heavy 9.2in secondary armament. A proposal by the battleship section for an all-in armament was not accepted. The increasing distance at which fire was opened led to the requirement to measure range and estimate its future changes so that projectile and target should meet. Fully integrated fire control systems lie just outside the time scale of this book but Dreadnought had many more mechanical aids to gunnery than is generally realised, all part of the drive to ‘hit first, hit hard and go on hitting’ as Fisher put it. Accurate sights were the first requirement and Dreadnought had the first direct action sights, attached directly to the trunnion, eliminating the backlash in the linkages which had caused many problems. Rangefinders, devised by Professor Barr, had been introduced in 1892. These instruments had a length of 4ft 6in and had a 1 per cent accuracy at 3000yds. A 9ft range-finder was introduced in 1906 which had the same 1 per cent accuracy at 7000yds and Dreadnought was amongst the first ships to receive these longer rangefinders. With opposing fleets moving at different courses and speeds, perhaps manoeuvring as well, range and bearing would be altering continually, even during the time of flight of the shell (up to 30 seconds). The Dumaresq was a mechanical computer which could estimate the range rate and deflection when fed with the ship’s own speed and estimates of the enemy course, speed and bearing. Spotting the fall of shot allowed corrections to be made first for deflection, then for range and, once hitting, for rate. The information from the Dumaresq was used to update another instrument, the Vickers’ clock which gave a continuous indication of the estimated range of the target. Dreadnought’s embryonic fire control system had both these instruments. As completed there were two transmitting stations on the middle deck, in the lower conning tower and the lower signal tower. These were very vulnerable and the forward one was moved below the protective deck in 1909. 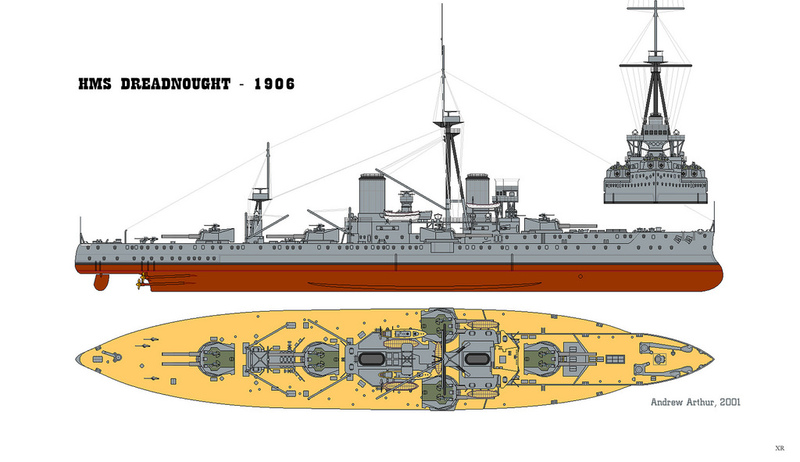 Dreadnought’s fire control equipment was adequate when neither the range nor its rate was changing rapidly. Once the training and elevation gear was improved, it became both possible and, indeed, essential to examine the far more difficult problem of rapid changes. Fisher was still talking of the need for firing single shots (rather than salvoes) at long range and while Dreadnought was given a big fire control top supported on a rigid tripod, Jellicoe ensured that it was in the hot smoke plume from the fore funnel. The establishment of a ‘central nervous system’ connecting control top, transmitting station (TS) and guns made it possible to destroy the capability of the ship by damage to the connecting wires. This problem was appreciated by her designers who tried to ‘reduce the vulnerability of the system by protecting as much as possible and by duplicating both cable runs and their power sources. It was a general requirement that cables should be behind armour ‘as far as possible’ though in Dreadnought herself the TS were unprotected initially. Cables were led into the turrets along the hydraulic walking pipes and up the central trunk. The main cables were not duplicated but were fed from two switchboards, fore and aft, and below the protective deck, each of which was fed from two motor generators supplied from different sections of the main electrical supply, itself below the protective deck. An armoured tube carried communications to the conning tower; those to the foretop were not duplicated initially (probably later) and were run down inside the tripod legs which gave them some protection against splinters, though not against a direct hit as experienced by Invincible at the Falklands. On her experimental cruise to the West Indies the communications from the foretop to the forward TS consisted of four voice pipes and two navyphones so that range, range rate, spotting corrections and deflection from the Dumaresq had to be passed verbally. 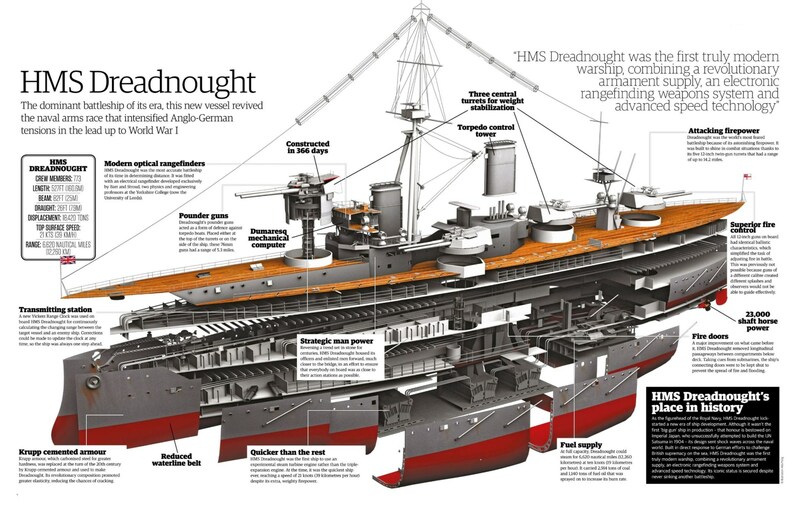 As a result of the recommendations from that cruise, Dreadnought was one of the first eighteen ships to receive ‘step by step’ transmitters to pass range from the finder to the transmitting station and hence to the gun. These required less wiring than earlier communications. The earliest such transmitters were troublesome and Dreadnought had the Vickers Mark II which was generally satisfactory. It is interesting that Bacon (and others) gives the increasing range of torpedoes as one reason for increasing the range at which the gunnery action was to be fought. The latest RGF ‘cold’ compressed air torpedo in service at the time Dreadnought was designed had an extreme range of about 3000yds at slow speed but were normally used at shorter range (1500yds) and higher speed though the introduction of the gyroscope from about 1895 had much increased its accuracy. In 1905 Armstrong demonstrated the first heater torpedo in which fuel was burnt in the air to increase the energy available. Though this prototype was not really practicable, the potential was clear and heater systems were introduced by Whitehead (largely a subsidiary of Armstrong) from 1907. The Factory, Vernon and all concerned with torpedoes were convinced by 1905 that long range (6000yds or more) torpedoes would soon be available. In turn, this led gunnery experts to see the torpedo as a reason for increasing gun range. The fear of the torpedo was a major factor in forcing the Navy to longer battle ranges though experience in the First World War showed that the torpedo was much less effective than anticipated. At 6000yds, the running time would be at least 6 minutes during which the speed or course of the target was only too likely to change. It was also found much more difficult to launch a co-ordinated attack than had been expected, something which should have been recognised from the Russo-Japanese war. Fisher and, independently, the DNC battleship section saw standardisation with a single-calibre armament as leading to worthwhile savings in ammunition supply, spares and in training. Narbeth gives a fascinating account of the development of battleship design from Majestic to Dreadnought. In particular, he says that the increased power of secondary batteries in foreign ships led the design section to propose four twin 7.5in turrets be added to the King Edward VII class, changed by White to four single 9.2in. While White was absent sick, his deputy, H E Deadman, proposed a very large battleship. In the next class, the Lord Nelson, the design section proposed an all-12in armament, which was not agreed. It would seem that the design team saw the all big-gun ship as the logical end point of a more powerful secondary armament. It is worth pointing out that prior to Dreadnought the fighting range was about 3000yds at which both the 6in and 12in could hit frequently. The generally-accepted view was that the enemy should be disabled by a hail of 6in fire, using HE shells and then sunk by AP shells from the 12in. The 6in ‘secondary’ armament was an important (to some the most important) weapon in fighting enemy battleships. Lesser guns, 12pdr and below, were provided to deal with torpedo boats. There were a number of other influences, mainly writers of books and press articles, which may have affected the general climate of opinion. The most important of these was Cuniberti, the distinguished Italian naval constructor, who wrote an article for the 1903 Jane’s advocating the fast, all big-gun ship. Cuniberti seems to have been thinking of fairly close range fighting but he did bring out the destructive power of the 12in gun. His proposal was quite impractical; he envisaged twelve 12in guns in eight turrets, a complete 12in belt and a speed of 24kts, which would require double the power needed for 21kts, much more powerful machinery of heavier, reciprocating design, more guns and armour than Dreadnought, and all on a smaller ship of 17,000 tons! At the period when naval thinking was moving to the Dreadnought concept, most naval journalists were still preaching the ‘hail of fire’ from 6in guns as the decisive weapon. They misread-or were unaware of-the lessons of long-range firing and saw only that few hits were scored, failing to realise that those few could be decisive and that properly equipped and trained ships could score many more hits. Attention will now be directed to the technical developments which made Dreadnought feasible. The idea of the steam turbine occurred to several people at about the same time but the first to patent a workable design was the Honourable Charles Parsons in 1884 and, as all early RN turbines were of his design, the others need not be mentioned. His early turbines were intended to drive dynamos where their high rotational speed was valuable and one such unit was fitted in Victoria to provide lighting while she was building in 1885. In 1894 Parsons set up the Marine Steam Turbine Company at Wallsend and, after some very careful model experiments, he built an experimental steam yacht, Turhinia, now preserved at Newcastle. Her steel hull is 100ft long with a beam of 9ft giving a displacement of 44.5 tons. Steam was supplied by a water tube boiler at 210lbs/sq in and, initially, passed to a single, radial-flow turbine developing 960shp at 2400rpm. Despite many trials and modifications she was unable to exceed 19.75kts due to cavitation on the single screw. In 1896 she was re-engined with three turbines-HP, intermediate, LP-each driving one shaft with three widely-spaced propellers on each shaft. She reached 34.5kts on trials which were attended by White and the Engineer-in-Chief, Sir John Durston, who had done much to encourage Parsons. The following year she gave a demonstration at the Diamond Jubilee Review, steaming up and down the lines some 4kts faster than any warship. Again, the Admiralty reacted quickly and in March 1898 they ordered the destroyer Viper from Parsons (hull sub-contracted to Hawthorn Leslie) of 370 tons and generally similar to the ‘30-knotters’ but with a contract speed of 31kts. Her hull cost £19,800 and the machinery £32,000 with a further £1200 for auxiliary machinery. On trial she reached 33.38kts at design load and, running light, made a one hour run at 36.5kts. Viper had four shafts each carrying two 20in diameter propellers, the HP turbines driving the wings and the LP, the inner shafts. At 31kts the specific coal consumption was 2.38, as good as the 30-knotters, but at lower speeds her consumption was very high. In service, Viper could make 26kts with half her stokers at work and, using them all, 31.5kts for a very short time, 30.5kts for half an hour. There was little or no vibration (by the standards of the day), steering ahead was good but, going astern, she could not be kept straight and would circle though there was plenty of astern power. The following year (1901) she was wrecked on rocks off the Channel Islands. 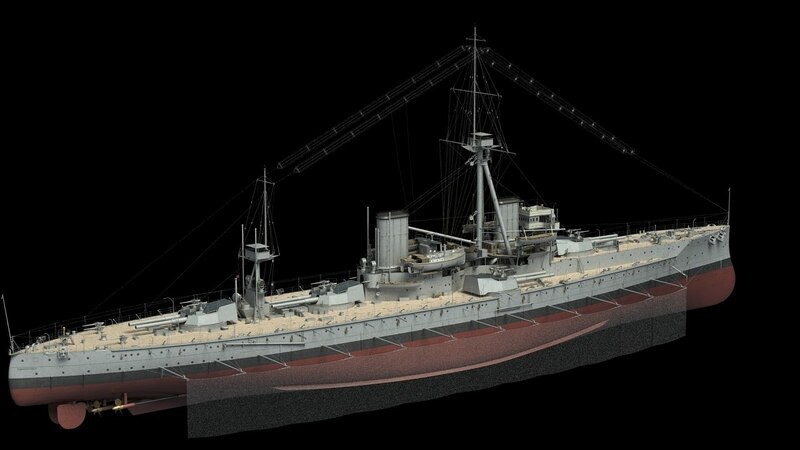 Armstrong built a somewhat similar destroyer for ‘stock’ and she was surveyed by Mr ßall, Assistant Constructor. In his report he noted many structural details which needed improvement to bring her up to Admiralty standards but thought her generally satisfactory. A later report by Mr Pine, Constructor, was less satisfactory, drawing attention to lack of girder strength, particularly aft and this was noted by the very experienced Henry Deadman in a note of 12 February 1900. Despite this and the very high price of £70,000 compared with £53,000 for Viper. ; she was purchased for the RN in 1900 as Cobra, subject to stiffening. Her four shafts each carried three propellers – twelve in all, a record. It was decided that she needed forty-eight stokers and a complement of eighty but there was cramped accommodation for only seventy. On trials, in June 1900, with numerous stokers, she reached 35kts. In September 1901 she broke in half on her delivery voyage, discussed later. The loss of both Viper and Cobra delayed the gathering of experience on turbines. Velox had been laid down by Parsons at Hawthorn Leslie as a private venture but was purchased by the Admiralty in 1901. She, too, had four shafts (eight propellers), the outers being driven by HP turbines while the inners had both LP turbines and small triple-expansion engines for cruising. She was intended for 27kts at design displacement which she achieved on trial (she made 34.5kts light). Fuel consumption was very heavy, even at full speed, and the reciprocating engines which could give 10kts were not very economical either. The real problem was that turbines are efficient only at high rpm whilst propellers function best at low rpm; only the introduction of the geared turbine could resolve this dilemma. Also in 1901 the Admiralty ordered Eden of the River class to be fitted with turbines. She had three shafts with two propellers on each, running at much higher rpm than her near sisters, which had two shafts, each with one propeller. She had special cruising turbines with the HP on the port shaft and the LP to starboard. At speeds below 14kts steam passed through both cruising turbines and then into the main turbines. Between 14 and 19kts, the HP cruising unit was cut out and above 19kts the main turbines only were used. With this complicated arrangement she could steam 3.39nm/ton at full speed and 17.33nm/ton at 13.5kts (12-hour trial), the latter figure comparing badly with the reciprocating boats which achieved 24-31nm/ton under similar conditions. Later there was a comparative trial with Derwent, also built by Hawthorn Leslie. This must have been seen as encouraging as it was the last trial before turbines were selected for Dreadnought. The next naval trial of the turbine was in the cruiser Amethyst but she had not gone to sea26 when the decision was taken to use turbines for Dreadnought; indeed, she had shed the blading and broken the casing of one of her turbines during a basin trial. In addition to turbine trials in warships there were a number of installations in merchant ships whose success contributed to the decision to use turbines in Dreadnought. Perhaps the most influential was that of the Clyde passenger steamer King Edward, 3500shp and 20.5kts, in 1901. Other important applications were the Cunard Carmania (1901) and the Allen liner Virginia (1902) and in 1903 Cunard, on Admiralty advice, decided on turbines for Lusitania and Mauritania. This reduction in weight had been accompanied by an increase of safety. Following the loss of Victoria, there had been a continuing effort to reduce the number of holes in bulkheads such as doors, ventilation trunks and penetrations for pipes and wires. By the Lord Nelson, the main transverse bulkheads were virtually unpierced. Lifts were fitted in the machinery spaces to reduce the effort needed by engineers33 to get from one space to another. The need for such unpierced bulkheads was perceived as a lesson of the Russo-Japanese War but action had already been taken. The Russo-Japanese War had shown the need for improved protection against mines and torpedoes and it was thought, probably incorrectly, that the heavy internal bulkhead of Tsessarevitch had saved her.34 This was discussed in August 1904 during a visit of the Admiralty Explosives Committee to the Armstrong test sites at Silloth and Ridsdale during which Noble suggested a 4½in bulkhead and proposed secret tests at Ridsdale with a mock-up of a battleship.35 Tests were carried out during 1905-06 with a thick longitudinal bulkhead built into a merchant ship named Ridsdale which was able to withstand a 230lb charge.36 These trials were carried out in great secrecy and no further details have been found. Their importance is shown by a note on the First Lord’s briefing paper for his Parliamentary statement on Dreadnought which said ‘Do not tell House of Commons about special measures to protect magazines and shell rooms as these are the result of very secret experiments carried out at great cost before she was laid down to test the experience of the Russo-Japanese war in submarine explosions.’ There is also a reference in the Ship’s Cover to changes as a result of the Ridsdale tests. Fisher is rightly seen as the father of the Dreadnought, supplying the drive and enthusiasm; while others debated, he decided. In detail, his lightning-swift brain was also unstable and his vision changed frequently; only in November 1904 did he settle on the all-12in ship. Fisher’s obsession with the ‘super battleship’ goes back at least to the time in 1881 when, as captain of the Inflexible, he discussed with the young Phillip Watts the design of an improved version with four twin 16in MLR. Much later, in 1900 as C-in-C, Mediterranean, he persuaded the chief constructor of Malta Dockyard, W H Gard, to prepare studies for powerful battleships. Though some of these had a uniform calibre armament, probably 10in, Fisher’s letter to the Admiralty in June 1901 proposed a mixed armament of 10in and 7.5in. Whilst C-in-C Mediterranean, Fisher was still writing that, at the ‘longer’ range of 3-4000 yards, the 6in was superior to the 12in because its higher rate of fire enabled the range to be found more quickly. Fisher and Gard came together again in 1902 when the former was C-in-C Portsmouth, and the latter manager of the Dockyard. Gard prepared two more studies, one with sixteen 10in and the other with twelve 12in. At that date Fisher favoured the 10in version, still under the influence of Armstrong (who died in 1900) who suggested a new gun with a high rate of fire. Gard was a highly respected officer but his career had mainly been in Dockyards and he lacked recent design experience. While it is easy to sketch a ship with sixteen big guns, it is less easy to produce a realistic design, particularly when the effects of blast are considered. In favour of the 12in was the more extensive damage caused by the bigger shell. It would seem that Bacon was the leading supporter of the all-12in armament, influenced by the papers of the two Mays,44 and by November, Fisher had decided on this fit though his papers make it clear that he was still thinking of firing one gun at a time at about 6000yds. So far, this account has concentrated on factors which led to the Dreadnought battleship concept but many of the developments involved were also applicable to big cruisers and, by 1904, Fisher was beginning to suggest that the submarine would soon make the battleship obsolete and that the fast armoured cruiser was the surface ship of the future. The concept of the battlecruiser, as it was to become, is discussed later but, to Fisher, they were interacting ideas though his heart lay with the cruiser. In Naval Necessities, he floated the idea of doing without battleships but Lord Selborne quoted Mahan in rejecting such a radical proposal saying the time was not ripe until other navies did so. Prior to taking office as First Sea Lord in 1904 Fisher produced a manifesto which he titled ‘Naval Necessities’. There were several versions of this paper but the first and most influential is dated October 1904 and sent to the First Lord, Lord Selborne, and the help of the think tank was acknowledged. It was a complete plan for the re-organisation of the Navy. The new ships were to be paid for by savings from the scrapping of old, ineffective units which would also supply the manpower. 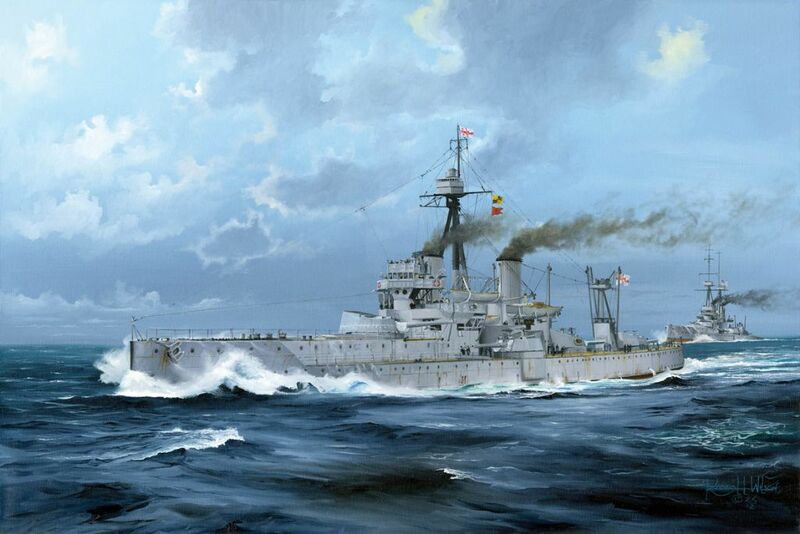 There were already problems with the 1904-05 Estimates due partly to the unscheduled purchase of Swiftsure and Triumph the previous year and to outstanding payments on Navy Works. There was emphasis on the need to keep both the battleship and the cruiser under 15,900 tons, presumably a magic figure to keep politicians happy. An argument often advanced against the introduction of the Dreadnought is that it rendered obsolete the older ships in which the RN had such superiority. All navies would start equal with the new type. The counter argument seems valid, that the all-big gun ship was coming anyway and the RN should get in first. As will be seen later, the USN was far advanced with such ships and there were indications that Japan and Italy were thinking on similar lines. Fisher also made the point that 1905-06 was a particularly favourable time to make this inevitable change since the powerful Russian navy had been largely destroyed. A further point which could have been made, but was not, was that the power and speed of Dreadnought depended on turbine machinery and it would be a few years before other navies caught up. This version of the paper still sees a choice between 10in and 12in (9.2in or 10in for the cruiser; the 12in is ruled out as too heavy) and says that the choice is between sixteen 10in or eight 12in. He claimed that the layouts would permit ten 10in to fire on any bearing but only six 12in. He expected three to four rounds per minute from the smaller gun and ‘nearly two’ from the 12in with about 50 per cent hits at 6000yds. The torpedo threat made it essential to keep outside 3000yds which, with an allowance for manoeuvring meant a mean action range of 5000yds. In a somewhat confusing passage he says that the action will be fought at a range chosen by the faster fleet but accuracy depends on peacetime practice – no mention of fire control – and the important factors are hitting with a low trajectory (suggesting fairly short range) and deliberate fire for spotting. The damage per hit will depend on remaining energy and charge weight whilst rapidity depends on time to load and number of guns limited by spotting time. An all-12in armament is right for a battleship but unnecessarily heavy for a cruiser. Fisher quotes Noble on the need for 4in anti-torpedo boat guns; the 12pdr was to small to disable the target quickly. The 12pdr dated back to the 1894-95 shore trial, discussed in the previous chapter. The Russo-Japanese War suggested that a 4.7in was the smallest suitable gun which was followed up in the firings against Skate leading to the 4in gun but with the heavier 3lib shell replacing the 25lb. All Fisher’s concepts were high-speed ships, generally some 3-4kts faster than contemporary designs. He offered no analysis to support this choice of speed – but analysis was not common in those days-nor did he appreciate that the advantage would be lost when other navies built faster ships. When C-in-C Mediterranean in Renown he though that ship fast enough to roll up enemy cruiser lines. He insisted that the speed must be ‘real’, achievable at sea and required a high forecastle to this end. He was still envisaging triple-expansion engines but made no comment on the inability of such machinery to sustain high speed. Fisher’s paper contains an interesting section on ‘Unsinkability’ which, surprisingly, is rarely quoted. He suggests unpierced bulkheads with no doors, pipes or wires except the steam pipes which were to be high up. Each machinery compartment was to be self-contained with lifts for access and an increase in engineering staff would be accepted. Ventilation and drains would be separate for each compartment. The magazines were to be clear of the outer bottom and protected by a thick longitudinal bulkhead. The 10in design was to have a 9in belt and 12in in the ship with 12in guns. There would be a 7in upper belt but no armour above the 2in protected deck. Any hatches in this deck which had to be opened in action should have a coffer dam to 5ft above the waterline. The unprotected deck above would provide light and airy mess decks; he wanted square ports. Examination of the plans suggest that there were no vital spaces on this deck once the transmitting station had been moved down. Bunker doors were a hazard in action and he proposed the use of oil fuel when in action though retaining coal for cruising. No wooden decks were to incorporated, corticene being used on the upper deck and bridge. He wanted the foremast taken down to the armour deck as a communication tube, 6in thick. Boats were to be worked by crane as in Vulcan. Fisher does not seem aware that most of these ideas were already incorporated in the Lord Nelson design. This entry was posted in British, Warship by MSW. Bookmark the permalink. I’m trying to work out a sensible combination – 6 turrets with a single 12in gun and 2 turrets with three 12in guns each?